The Amazon River dolphin is a species of toothed whale and the largest in size among the river dolphin species. It’s also generally considered as the most intelligent with a little less than double the brain mass of a human being. This dolphin lives only in freshwater: specifically in the larger Amazon River basin. Individuals grow pink in color as they age, therefore leading to the common nickname “pink river dolphin”. Hunting for use as bait is a major threat to these sea mammals. Also, loss of habitat and entanglement in fishing lines. 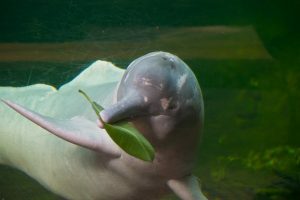 This entry was posted in Species Profile and tagged Amazon river dolphin, boto, dolphin species, pink river dolphin on June 25, 2017 by Roselyn Onuche.